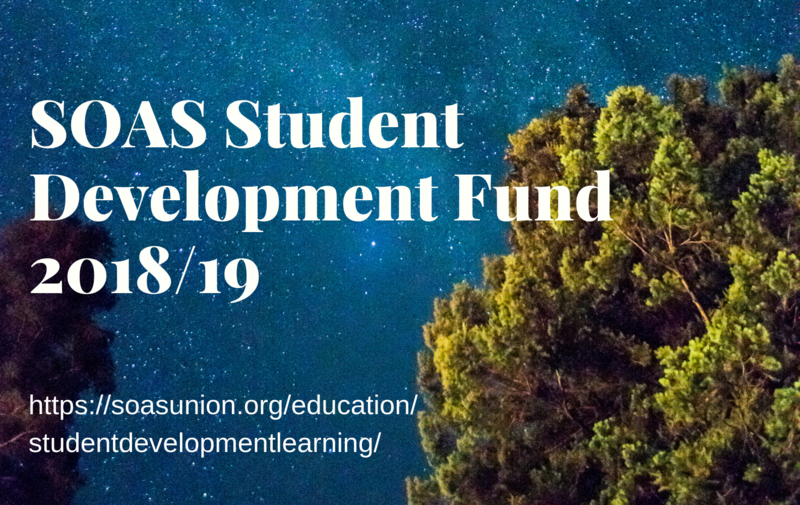 WHAT IS THE STUDENT DEVELOPMENT FUND (SDF)? SOAS SU were allocated £20,000 from the Pro-Director Learning and Teaching budget to create and manage the SDF this year. This was agreed between Prof Deborah Johnston, Pro-Director Learning & Teaching and Tam Hau-Yu, Co-President Democracy & Education. Individuals and groups can apply. We are looking to award up to £500 per student if your application is successful, for student projects and/or training which further personal and professional development. IMPORTANT: Applications for the SDF must be distinct from avenues of financial support already offered/ available from the School (Academic departments, Professional services e.g. Widening Participation, Student Advice & Wellbeing, Careers etc) and the Students' Union (societies budgets). Before you apply, you are advised make timely enquiries first from the ports of call listed above - lecturers and tutors, academic advisors, department/s, Student Advice & Wellbeing, SOAS Careers etc. Please note that we will ask about this in the application! All Undergraduate and Postgraduate Taught students enrolled at SOAS may apply for the Fund. If you or a team member is an intercollegiate student, exchange student or a Foundation year student, please contact us. The Fund is not open to Postgraduate Research students as the Doctoral School administers a Grants system already. However, all available funding for this has now been allocated for the year 2018/19. The SU has committed to top up PGR conference funding by £5000 as per a passed UGM motion. If you are a PGR student with questions please email both Hau-Yu and Kira Brenner, Research Students' Association President and PGR Officer. WHAT OPPORTUNITIES CAN I APPLY FOR?? The SDF covers core costs such as registration fees and material costs. We will consider covering travel expenses and accommodation, as these constitute high costs. Food and expenditure will not usually be covered. Please provide more details in the financial breakdown. WHEN DO I APPLY/ WHAT IF MY OPPORTUNITY IS NOT YET CONFIRMED? Application deadline dates are currently being confirmed, hence the form not yet being live. You may apply for funding retroactively - meaning that you can apply for funding for an opportunity which already happened, so long as it falls within this academic year 2018/19. We recognise that opportunities occur at all points of the year. You are welcome to get in touch with Hau-Yu via email if you have a deadline coming up soon or have any questions. This isn't likely. Contact hy12@soas.ac.uk if you have questions. We will not generally process applications that request funding of less than £100, as we believe this could be covered by the School - but let us know if this is not your experience in your application. £500 is the recommended upper limit amount. We will ask you for a rough financial breakdown of the amount you are seeking. Applications for opportunities that will demonstrably benefit you and your chosen field in the short run and long run. We consider it equally important that you share that knowledge with your fellow SOASians and communities, and demonstrate how you intend to do this in the short and long run - for instance, via a written report, film/video, public talk, performance etc. You should receive a copy of your responses, and a formal receipt from us of your application. We may contact you with more questions. Please note that the panel may decline to fund your opportunity, or agree to fund it to the full amount. A third alternative is partially subsidising the amount you applied for. Feedback and reasons will always be given. The SDF has a purpose of promoting inclusion, access, respect and shared learning. This fund will prioritise applications from Widening Participation backgrounds. We aim to award at least half the fund in this way, and diversely at that. However, we strongly encourage candidates from all backgrounds, ages, disciplines and future trajectories to apply. Applications will be kept anonymous - but news will be updated on this webpage. Further we also intend to showcase more information about the awardees' experiences and work here.